That general upgrade strategy worked just fine for me into BH6 but it was totally turned on its ear the moment I discovered how formidable the Roaster was and that the L6 MultiMortar could take out a Sneaky Archer in a single volley - several if they were standing together. This is when I switched gears and started upgrading the MultiMortar and Roaster first. At BH7, the Roaster and MultiMortar were the very first defenses I upgraded. I then came back around to my standard upgrade path - FireCrackers, AirBombs, Hidden Teslas, Crushers, Double Cannons, Cannons, Archer Towers. On a whim, I decided to do insert the Guard Post in there before the Cannons and the Giant Cannon came after the Crushers. This was entirely in response to changes in the meta at BH7. Ground had become the go-to army comp, as usually happens at the beginning of a new level, but I realized something else - we were in a unique place with the game. EVERYONE was new to BH7 and scrambling to develop their offensive capabilities. Having major defenses down would be a significant liability as soon as players had their first L14 troops ready so there was no time like the present to get those expensive, LONG running upgrades out of the way. This game is now nearing the conclusion of its work at BH7. 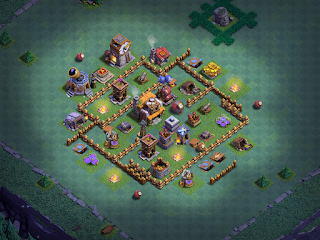 All that remains of defense upgrades are one Cannon and the three Archer Towers. Likewise, I decided to upgrade my Battle Machine to level 15 relatively early on - after I had most of the major defenses completed (Roaster, MultiMortar, FireCrackers, AirBombs, Hidden Teslas). It took a little finagling, but I was able to do the L11-L15 upgrades without significantly disrupting my defense upgrades. Many players are alternating these upgrades with 2 day defensive upgrades as well. Right now, I have him up to L17 and I am alternating - BM upgrade, defense upgrade, troop upgrade, defense upgrade, BM upgrade (lather, rinse, repeat). This ensures no spillage of resources even though the BM is a 3 day upgrade. Every so often I might have to upgrade a wall along the way. This brings up another important point - SuperCell has told us that BH8 will NOT be released in December. This gives us a solid month - maybe longer - of upgrade time on our games. In my case, I'm working on walls in between other upgrades and will soon focus on just walls and troops. I run mines and traps in between the other defenses, usually when I'm running just short of enough for a building upgrade. I've also tinkered with moving things around in the order - for example, I've moved the Guard Post up to just after the Crushers, run all 7 levels of Giant Cannon upgrades at once, upgraded the Crushers before the Giant Cannon, Giant Cannon to level 5 before the Hidden Teslas to level 7...the net effect tends to be the same. Offense has changed as well. Once I discovered the power of Drop Ships, I shifted away from Beta Minion / Night Witch to Beta Minion / Drop Ship. This was a significant move - Drop Ships take MUCH longer to max than Night Witches, especially when I often max Night Witches at BH6. The Battle Machine, unfortunately, has become even less a factor than it was in previous levels and this surprised me. The new Giant Cannon is pretty fierce against the Battle Machine; enough so that a Giant Cannon still on the game grid after the initial attack will determine whether the Battle Machine is even useful. When the Giant Cannon is positioned next to the Builder's Hall, it is the silent guardian of the BH. I will often try to pick up some percentage points on the outside and not even attempt to get the BH down if all I have left is the Battle Machine and the BH is at greater than half life with that GC still guarding it. Whereas a L1 Battle Machine was a deficit at BH6, I have no issues with taking the Battle Machine as level 1 into BH7 then upgrading it to L5 and not touching it again until the end of the BH upgrade cycle. My upgrade strategy for the Battle Machine is to do occasional level-ups in between defenses. For lower level Battle Machines, it can be slotted in anywhere. Two day upgrades go well opposite two day upgrades of defensive structures. The three day upgrades, though, have been a bit trickier. I ran my 3 and 4 day defensive upgrades early at BH7, so by the time I hit Battle Machine levels 16-20, all I had left were two day defensive upgrades. So I ran a Battle Machine upgrade followed by two defensive upgrades and one troop upgrade then circled back around to the Battle Machine. This prevents me from overflowing my storages. While playing the current game, it's important to be thinking about the new meta under BH8. If you can't get everything maxed, what things should you focus on maxing now to be best prepared for BH8? I submit that the answer is the same -> For Defense: Roaster, MultiMortar, Giant Cannon, FireCrackers, AirBombs, Hidden Teslas, Crushers, Double Cannons, Guard Post, Cannons, Archer Towers...and likely in that order; For Offense: Key attack strat, Beta Minions, Drop Ships, Raged Barbarians, Bomber, Night Witch, Sneaky Archer, Boxer Giant, Cannon Cart, Baby Dragon (or a similar order); Battle Machine to L5 then in between other upgrades as fits.